3) Web 2.0 - What Does It Mean To You? Please join Net Atlantic and Exclusive Concepts for a jointly-held 30 minute webinar on Tuesday December 12th at 12:30 PM EST. The topic is Making Newsletters Work. The cost is free! We promise no big sales pitch, just great newsletter ideas. Q. What should be in the subject line? Q. Which kind of newsletter gets more clickthroughs, plain text or html? Q. Where should your offer be in your email? Q. Which ISPs block newsletter images by default, and what should you do about it? Q. How is email to business different than email to consumers? Description: Are you considering starting an email newsletter for your customers - or would you like some ideas to improve your newsletter's results? Then this is a must-attend webinar for every marketer interested in improving results in 2007. We'll provide real action-oriented suggestions for improving open rates and click-throughs. We'll share our collection of best practices in e-mail newsletter design and delivery. 2) Client Profile - Funkitron! Funkitron, Inc. is a game publishing company founded by game industry veteran Dave Walls in 2001. Funkitron is known for creating high-quality, fun games that appeal to a broad audience and can be distributed digitally via online networks. The company has had much success with hits such as "SCRABBLE® Deluxe", "SCRABBLE® Blast", "Poker Superstars IIT", "Boggle® Supreme" and the just released "Slingo® Quest"
Everyone throws around the term "Web 2.0," but what is it really? Web 2.0 implies an information and computing platform rather than a content storehouse. Sometimes called the "New Internet," Web 2.0 promotes thin client computing, where everything is stored on servers (on the Web), and a user has access from any laptop or desktop computer via a Web browser. Client applications that do not require the browser can also be downloaded at any time from the Web. Web 2.0 also implies a Web-centric source for all information and entertainment, including news, weather, stocks, reference, podcasts, videos and streaming media. Blogs, Wikis and online communities such as Friendster are also part of the second wave of the Web. Web 2.0 also refers to technologies that allow data to become independent of the person who produced it or the site it originated on. It deals with how information can be broken up into units that flow freely from one site to another, often in ways the producer did not foresee or intend. 4) Web Browser Wars Rekindled - and the web surfer wins! If you have not already, check out one of these new free web browsers. If you are using one now, be sure to upgrade to the latest version! 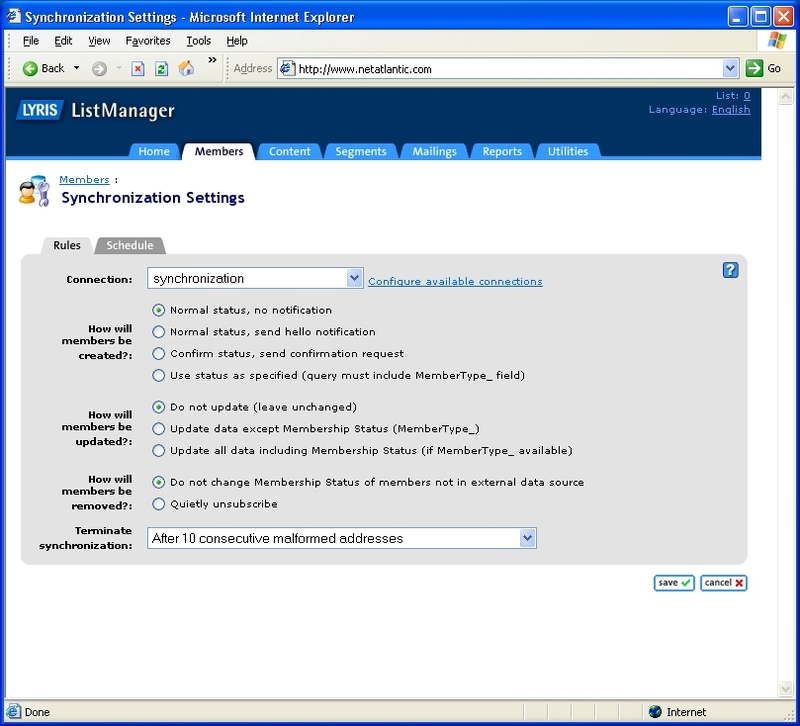 Net Atlantic's Lyris ListManager can now synchronize its data with other databases using ODBC (Open DataBase Connectivity). The service works great with Oracle, Microsoft SQL Server, PostgreSQL and MySQL. Other databases utilizing the ODBC standards will also work. You can synchronize with your in-house database over the internet according to a schedule, on demand, or just before sending a particular mailing. How it works: A Database Connection is established, specifying the connection string and SQL query to be used to connect to your external database server at your location. Once the database connection has been created, you can specify how ListManager handles the data from the external data source (such as overwrite, or append, etc. ), and with what frequency. You can also specify the default frequency for database synchronization. 6) Client Newsletters Worth A Look! As much as we would like to mention all of the fascinating customer email newsletters we host in this email, we can list a few that we enjoy here in the office. If you are so inclined, check them out, and subscribe! Net Atlantic has been helping individuals, businesses and non-profit organizations succeed on the Internet for more than 11 years. We offer best-in-class Internet services including Email Newsletter Hosting, Tier 1 Web Hosting, Discussion Newsletter Hosting, and more. Contact sales@netatlantic.com to learn more. You are receiving this newsletter because at one time you inquired about the services offered by Net Atlantic. This newsletter is published approximately four times a year. If you prefer to not receive email communications from Net Atlantic please unsubscribe.